Fr Ray Blake's Blog: The Holy Cross, not like the corpse of a saint! I always feel uncomfortable coming across a piece of the True Cross in a museum I never know what to do, to gawp or fall on my knees. Those who are thinking about 'doing something' on the feast of the Exaltation of the Holy Cross should remember that a fragment of the Holy Cross has more in common with the Blessed Sacrament than a bit of bone or the corpse of a dead saint. 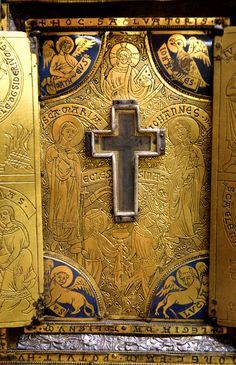 All the prayers and rites surrounding the True Cross presumed the wood of the Cross was drenched in the life giving blood of Jesus - it was never treated as a merely relic. The Good Friday veneration of the Cross has its origins in the veneration of the Cross in Jerusalem, it seems fitting that a fragment of the True Cross should be used rather than an image of it but, however that is not what the Rite calls for. Nevertheless when not exhibited for public adoration a fragment of the True Cross should be kept veiled in red, when it is exposed we are supposed to genuflect to it, in the same way as we do when the image is exposed on Good Friday, when it is carried in procession a red canopy or umbrellino is used and when a blessing is given with it, as with the Blessed Sacrament, a humeral veil is used, symbolising the blessing is not the priest's but come directly from God. NLM has some nice photographs from the Monastery of the Holy Cross in Austria. Thanks Father, didn't know that about the humeral veil. "If, therefore, we speak of the cross itself on which Christ was crucified, it is to be venerated by us in both ways--namely, in one way in so far as it represents to us the figure of Christ extended thereon; in the other way, from its contact with the limbs of Christ, and from its being saturated with His blood. Wherefore in each way it is worshiped with the same adoration as Christ, viz. the adoration of 'latria.'" Will there be an opportunity for veneration after the Wednesday morning Mass? Where can I find the rubrics about veiling a relic of the true cross. I have the pectoral cross of my great uncle and it contains a relic of the true cross with a certificate to that effect signed by the Archbishop of Lyons. It is a splinter laid on a white fabric cross with a red fabric behind that. I guess Bishops do not get such these days but when he wore it the relic would have been exposed and not veiled? There is a supplement in one of the Polish editions of the Rituale which helpfully provides the rite for venerating the relic of the True Cross, along with a number of decrees of the S.R.C. concerning the veneration of relics. The vestments, humeral veil, and umbrella should be red on most occasions. On Good Friday, the vestments are black, but the humeral veil and umbrella are violet. I suspect that the HC is no exposed for public veneration but enclosed within the cross proper.